Collects Doctor Strange: Damnation #1-4, Damnation: Johnny Blaze — Ghost Rider #1, Doctor Strange (2015) #386-389, Iron Fist (2017) #78-80 and Ben Reilly: Scarlet Spider #15-17. The city of sin meets its biggest sinner yet. 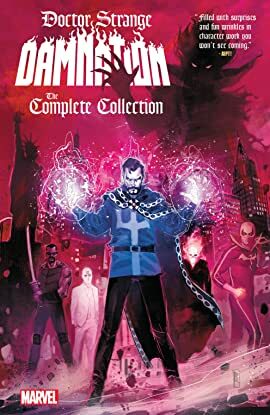 When Doctor Strange raises up Las Vegas from its destruction during SECRET EMPIRE, he inadvertently opens a door for the embodiment of evil: Mephisto! When the Lord of Hell claims the gambler's paradise for himself and sets his sights on the rest of the world, it will take a diverse group of heroes to beat the devil at his own game. Wong's makeshift band of Midnight Sons — Iron Fist, Blade, Moon Knight and Scarlet Spider — must face down a whole platoon of Ghost Riders…but where does Johnny Blaze stand? 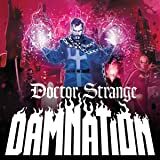 DAMNATION transforms the life of Doctor Strange — and the magical landscape of the Marvel Universe!